Engraving shops dot the landscape. Many are unseen given the fact that engraving businesses may be operated out of the home. It's widely accepted that engraving makes a great business for the semi-retired or part-time opportunist and a storefront shop is not required. A simple investigation into your own community will probably reveal an engraving shop for every 50,000 to 100,000 persons and many will be run as part-time businesses. Also, many will favor a particular niche and only offer specific products such as trophies, name badges or electrical ID tags. Larger shops generally reside in locations that permit easy walk-in trade. Some will advertise quick turnarounds, others specific services. In all cases, personalized or marked items are in high demand. Each type of engraver garners his or her place in the engraving industry by the nature of their specialty. Trophy/Award shops are by far the most popular and most easily recognizable. It's generally accepted that these shops make up the lion's share of the "trade" type business and represent many long established companies. After trophy and awards, industrial users are the next major consumers of equipment and supplies. The applications are endless. ID plates, part-marking, and serialization are some of the more significant uses for industrial engraving equipment. Gift/Novelty shops or mall "kiosks" continue to gain in popularity. A primary reason is the ability to run many of the operations as seasonal or part-time businesses. Many are started as a result of recent fads such as personalized or "vanity" type license plates. These quick start-up businesses can yield great returns for the entrepreneur with a little extra time and cash. Many can be run with part-time help or high school students, keeping operating costs at a minimum. Regardless of the type of business chosen, there's no substitute for performing local area market research. This is a cornerstone in creating a successful start-up business. If you are unsure about issues like the local demographics you may be able to get valuable information from trade publications that take a periodic industry census. You may also want to check out local maps and seek information from the local chamber of commerce. Most community organizations will have a business development department that can supply you with the following key information at no charge: demographic reports, relocation or site assistance, and business directories with key personnel listings. How well served or saturated is the local market for the products I plan to feature? Is the potential customer base sufficient enough to support my business plans? Is the community healthy and does it provide a stable environment for my business? Are the demographic characteristics compatible with the market I plan to serve? 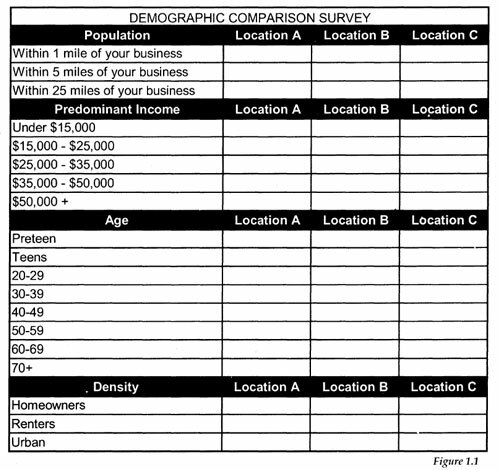 Figure 1.1 - contains a form that is just one way to determine if the local area's population has the demographic requirements to support your business. You may select several locations and make comparisons to determine the optimum location for your new engraving business. This is especially helpful if you plan to have a retail shop. Take a moment to fill it out now.